Imagine scrambling across the top of a peak, perched precariously on a rocky cropping overlooking the cliff edge with nothing but boulders, shale, and scree surrounding you. No people, no trails. Just you, the mountain goats, and whatever Mother Nature decides to provide. This is skyrunning. With this form of racing, you often see nothing man-made and are either on a slight trail, such as a goat trail, or are just going course marker to course marker in the wilderness. These races offer a variety of distances from 20 km up to 80 km (~12-50 miles) and can be found all over the world. You get to rise with the dawn above the clouds on the volcanic island of La Palma (Canary Islands) during the Transvulcania 74K, climb the mossy, green Curved Ridge in the Scottish Highlands during a rainstorm at the Glen Coe Skyline 55K, or boulder jump down the rocky ridge of Hamperokken to the glacier lake below, high above the Arctic Circle off the fjords of northern Norway at the Tromsᴓ Skyrace. These races are thought of in terms of hours versus kilometers due to each race’s terrain being so difficult to navigate and the vertical gain unfathomable to some–10,000 to 15,000 feet! 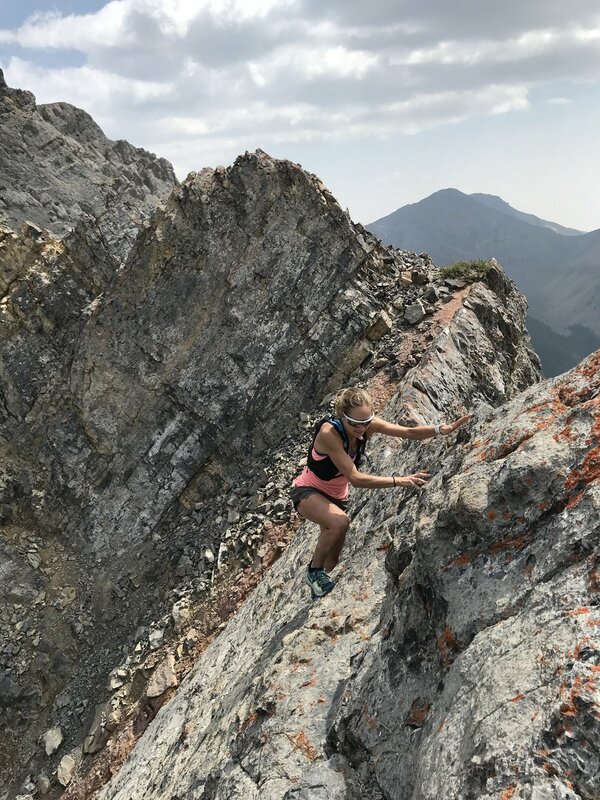 Speed is still critical in these races, but with a different mindset behind it–hiking, rock dancing, and controlled falling are the skills that are desired. You are only as fast as you can scramble technical chutes, traverse rocky boulder fields, or navigate river beds in knee-deep water. You also need to be able to sustain motion for 6-10 hours depending on the race. Training for these races can look quite different than other forms of races. Speed is still important but often achieved through hill-focused workouts. Vertical gain and strength with climbing is more important than mileage per week. Long runs on the weekend are often measured by time on your feet and vertical gain more so than the actual mileage. My weekend-long runs usually consist of “peak bagging,” where I am out in the backcountry off-trail, and I’m linking up a series of mountain peaks. This combines running, hiking, endurance, and strength. These workouts are often an all-day event, and nutrition is absolutely essential, often with a different mindset compared to typical trail running. Many of these skyrunning races have a self-supported feel, as it may be several hours between aid stations, or the aid stations are so remote they don’t offer a huge variety of nutrition products. My go-to tricks for keeping on top of my nutrition during these types of races are the use of high-quality products that provide a steady stream of energy, as well as having a portable design. These types of races require increased amounts of fluids, therefore carrying fluids with you is essential. I prefer a pack, as it is important to have your hands free, plus you are needing to carry extra nutrition and gear. The amount of fluids and nutrition products you go through is also increased compared to other forms of racing. I try to follow a 20 ounces of fluid per hour regimen, but obviously this fluctuates depending on weather, terrain, and my energy demands at each particular moment in the race. I utilize Skratch Labs Sport Hydration Mix to keep me on top of my electrolytes (the Matcha Green Tea & Lemon with caffeine is my favorite). This hydration supplement is easy to use on the go at an aid station (or at a convenient creek crossing) where I can just dump the powder in my bottle and refill with water. Caloric intake is also critical and has key differences for skyrunning. I try to eat between 100-150 calories an hour, but also will strategically take nutrition at key points in the race, such as before a big climb or when I’m feeling a low in energy. It is not uncommon to go through eight or more nutrition products in a race so it is important to be able to access nutrition easily and utilize it efficiently. I utilize the Skratch Labs Sport Energy Chews (Matcha Green Tea and Raspberry are my favorites). These chews are designed to provide a steady flow of energy and are designed to sit well in your stomach. Finally, recovery is also specific to skyrunning. It is important to jumpstart your recovery immediately following these events and the Sport Recovery Drink Mix from Skratch Labs is specifically designed to get all the needed micronutrients to your muscles quickly and sits well in a (sometimes uneasy) stomach. Essentially, all of these nutrition products are designed to work together to get your body back to feeling strong and replenished and ready for whatever is coming next! Now that you have the tools, I hope you can get out there and #SkratchTheSummit!